What is Readit Scholar HD? 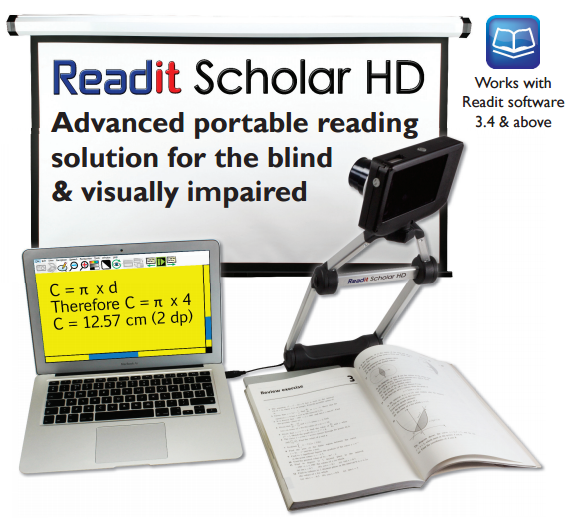 Readit Scholar HD is our latest portable Autoreader / CCTV system. Weighing just 1.2 kg (2.6 lbs) it is the ideal solution for users on the go. 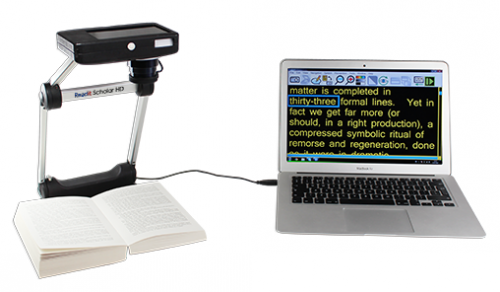 As well as full close up and distance CCTV functionality, Readit Scholar HD has the unique ability to capture both closeup (up to A3 or double Letter in size) and distant objects. Any text can then be automatically scrolled on screen and read aloud in seconds! What are Readit Scholar HD's benefits? Good height when in use of 40.5 cm off the desk. 720p (1280x720 resolution) up to 60 fps via single USB 2.0 connection (Core i3 processor required for 60 fps live view at full resolution). Open base design means it's easy to handwrite and read in the traditional video magnifier way, without the base getting in the way of the paper or book. 16MP sensor with A3 capture area down to 6pt text - this is 8x the resolution of the nearest competitor in the market that has a usable live image view. 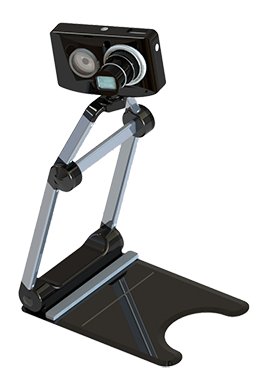 The combination of the 16 MP sensor, 21x optical zoom, optical and digital stabilisation means it can perform OCR at distance (for whiteboards and projectors) further away than a human with 20:20 vision can see - this is a unique feature again. Adjustable length, integrated USB cable - again this is unique. 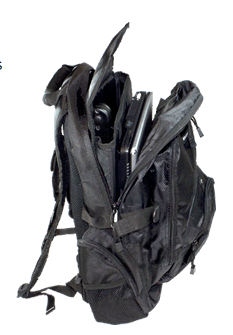 Includes headphones and laptop rucksack with easily enough space for user's laptop, charger, books and Readit Scholar HD. Who is Readit Scholar HD for? Readit Scholar HD has been specifically designed for the requirements of students, business professionals and anyone on the move with a laptop PC. Simply remove it from its included rucksack, plug into your laptop or PC and you have full CCTV with Distance Viewing, Auto Reading, Speech and more. Whole books can be captured, read and scrolled back automatically. 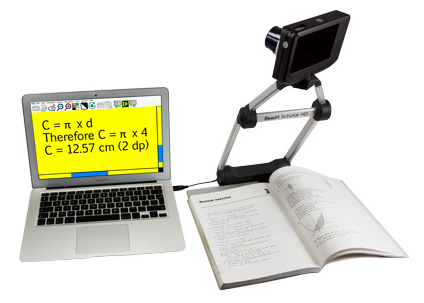 The whiteboard can be magnified 40x and your handwriting can be enlarged as you write! 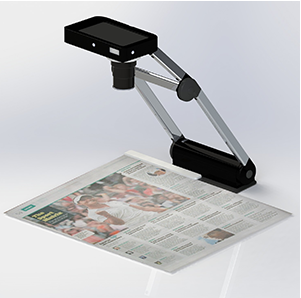 Weighing just 1.2kg, it folds flat and needs no batteries so is extremely portable. Just plug the lightweight camera into your PC or laptop and it instantly translates any printed text into crystal clear speech. Letters, receipts, bank statements, text-books, novels, product packaging etc. are all read with ease. It's also a crystal clear HD video magnifier running at a smooth 60 fps. You can pick the camera up and point it in the distance or at yourself and with 21x optical zoom and advanced image stabilisation it enables you to see further than a person with 20:20 vision! For a full list of software features, please click here: Readit Software. Backpack specifically chosen for carrying the Readit Scholar HD, up to a 15.6" screen laptop, other accessories and documents. Although Readit Scholar HD will function on any computer system 3 years old or newer, below is information on the minimum and recommended computer requirements.